Space will host commercial companies and research focused on health, wellness. If everything had gone as originally conceived, the land at Fourth and McKinley streets in downtown Phoenix would be smack-dab in the middle of the Arizona Cardinals NFL football stadium complex. Instead, last week in a formal groundbreaking ceremony, the city of Phoenix welcomed Wexford Science and Technology and Arizona State University to celebrate the construction of a new building on the Phoenix Biomedical Campus, the PBC Innovation Center. And while the local NFL football team has been playing games in its Glendale stadium since 2006, city leaders will tell you that that the effort with Arizona State University to attract the Wexford team was worth the wait. For ASU, this is an assignment that began three Phoenix mayors ago. The $77 million, 225,00-square-foot Wexford building will be the first piece of a 7-acre parcel ASU is responsible for on the city’s 30-acre biomedical campus. ASU will lease approximately 112,000 square feet — half of the building — for 15 years with three five-year options. The remainder will be occupied by private-sector companies — the part that organizers say makes this step so important to the city, to the campus and, ultimately, to discovery and innovation. Wexford Real Estate Company is focused exclusively on partnering with universities, academic medical centers and research institutions to develop vibrant, mixed-use, amenity-rich knowledge communities that are built on a foundation of research, discovery and entrepreneurial activity. Headquartered in Baltimore, Wexford’s portfolio extends across nine states and includes projects in key urban centers in Philadelphia, Chicago, St. Louis, Miami and Baltimore. It has 6 million square feet of property developed or under development. ASU’s involvement is catalytic and is key to attracting private-sector involvement, Crow said. Inside the building, ASU researchers and their counterparts will be unlocking discoveries. While a big step forward, the Wexford Building represents only a small portion of what will occur on the remaining portion of the site. The master plan for the 7 acres north of Fillmore includes approximately 1.8 million square feet of additional development of this innovation district. Rick Naimark, associate vice president for program development planning, who worked for nearly three years to find the right partner for this project, said the next building will come soon after this one — now called the Phoenix Biomedical Innovation Center — opens. It’s another move that will fill-in the bio-medical campus checkerboard the city envisioned when it turned away a public sports facility for something more complicated — but something with potential to pay off over and over again. 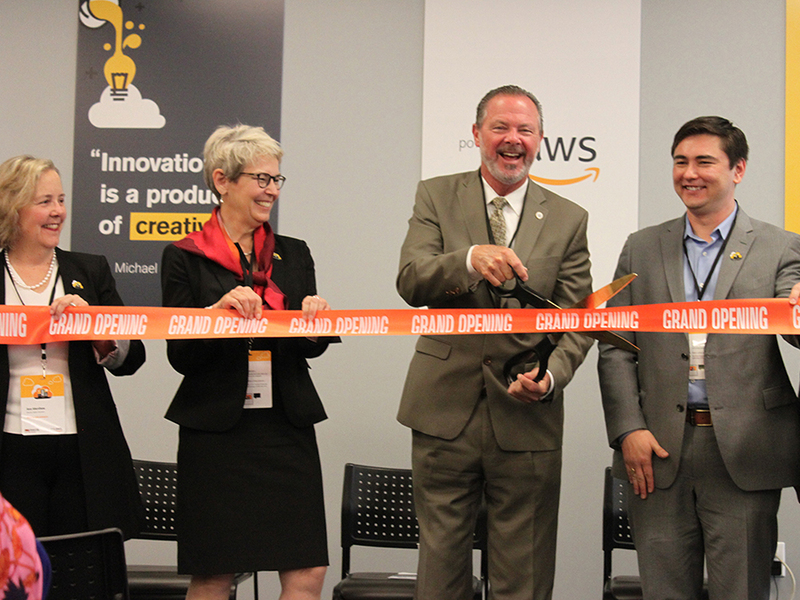 Arizona State University and Amazon Web Services (AWS) on Monday launched the ASU Smart City Cloud Innovation Center (CIC) Powered by AWS, an initiative that focuses on building smarter communities in the Phoenix metropolitan area by using AWS Cloud to solve pressing community and regional challenges. “What ASU has done here is not only build a process and a means of communicating so that all know what others are doing, but they’ve also raised the bar, insisted on the highest standards, and said we will invent and simplify here,” said Ann Merrihew, director of AWS. “The thing that I love about what ASU is doing is that it starts from inside. It starts with how ASU cares about its students. There’s a lack of feeling that it’s got to be exclusive — everyone matters,” Merrihew said. “And then saying, it’s not just us on campus. We live in a city, we live in a county, we are part of a global universe, and what we learn we’re going to share. During the ribbon-cutting event, Scottsdale Mayor Jim Lane addressed the ongoing partnership between city of Scottsdale, the ASU Foundation and ASU. Ben Butler, AWS global head of CICs, addressed the ways his team will support the center as it works with local planners to reduce infrastructure costs, spur economic and workforce development and solve real-world challenges by applying emerging technologies on the AWS platform. “The distinguishing factor between this and other AWS programs is that we’ll have dedicated staff working full time on-site, shoulder to shoulder with our ASU partners to address these change-the-world, think-big types of issues,” Butler said. Ann Merrihew, director of AWS, addresses why ASU was chosen as a Cloud Innovation Center (CIC) partner during the Smart City Center opening on March 11. Images of ASU mascot Sparky were used to demonstrate artificial intelligence. More advanced AI systems are a core component of the center. As a demonstration of how virtual reality will be used in the Smart City CIC, guests during the opening were offered virtual tours of ASU campuses. The Phoenix metro area is one of the fastest-growing regions in the U.S., according to Chris Camacho, president and CEO of the Greater Phoenix Economic Council, noting that demographically, the region also has the sixth-youngest market in the entire U.S.
“But that’s not enough,” Camacho said. “The convergence of innovation at scale with the multidisciplinary focus of this university, combined with our ability to solve the significant challenges with solutions born here, is critically important. According to Lev Gonick, ASU’s chief information officer, the CIC is a north star for greater Phoenix and Maricopa County. “But it also has a broader context,” Gonick said. “Because we very much know that the question of how to use technology to advance the quality of life and resilience of the community is not ours alone. It’s a global challenge.